By George Bamu on November 18, 2007. The premier of the Iron Ladies of Liberia at the 30th Denver Film Festival was nothing short of spectacular. Watching the depictions of the reconstruction of Liberia’s institutions of government after years of civil war, human and physical destruction, was a relief. The film was mixed with a little fun about how much the citizens have to work themselves up to bring about change, the governments’ attendance to citizen expectations about change and also the portrayal of the Iron Ladies, represented in the head of state, president Ellen Sirleaf Johnson and her cabinet, as tough-minded and ready to make change happen. Even though there are still threats to the stability of the nation from disgruntled and disenchanted citizens, at least, things appear to be moving in the right direction. That is what we are told from the film. There is assistance coming in from donor organizations such as the World Bank and also from China and the USA. Most important is Liberia’s transformation back to democracy and the restoration of the rule of law and freedom of expression. Citizens are able to challenge the government and ask for redress of their grievances. The press is becoming free and can play its role as the distributor of information. The government is able to maintain order, crack down on corruption, mismanagement and protect its citizens against unscrupulous forces which threaten daily life. How long before we see another war. 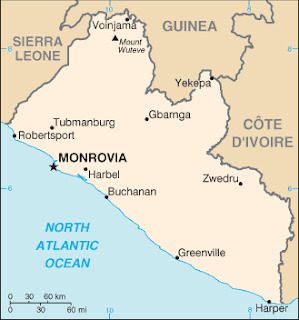 In my estimation, it would be a while before Liberia fully stands on its own again–but at the very least, some normalcy exists in the current setup. I wish Liberia the very best as it strives for peace and security. When I asked producer Henry Ansbacher during a Q&A session why he decided to produce the movie, his reaction was quick. He said they wanted to show that the transformation of Liberia after years of civil war was real and that it was a good thing. He stated that he thought the world needed to know that change in Liberia was important not just for Liberia but for the rest of the world. Overall, this was an excellent film. I give it an A score.